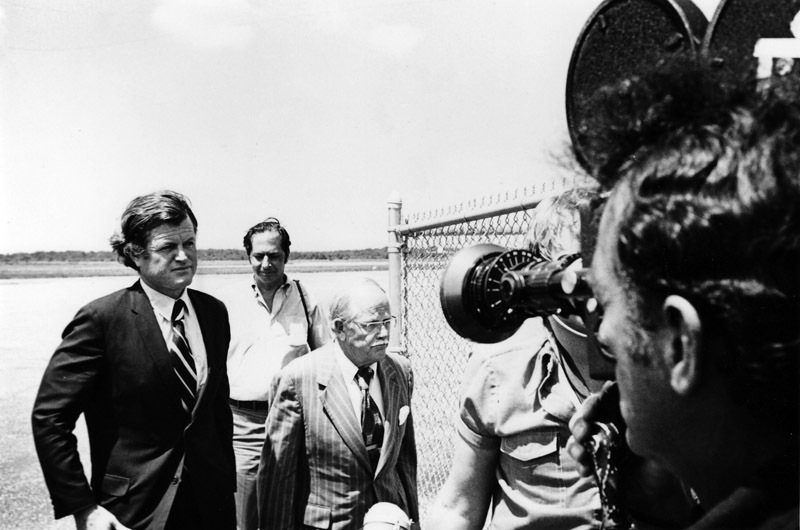 A young Ted Kennedy faces the cameras at the Martha's Vineyard Aiport. A Los Angeles movie company is currently casting actors for a film that will chronicle the story of the late Sen. Edward (Ted) Kennedy and the accident on Chappaquiddick in which a young campaign worker was killed. Apex Entertainment, which has shepherded big-budget films including Secretariat and Miracle, plans to begin production in the next few months. A company spokesman said the producers would like to shoot part of the film in Massachusetts, but have not yet made a decision about locations. Mr. Ciardi did not return a call from the Gazette by deadline. 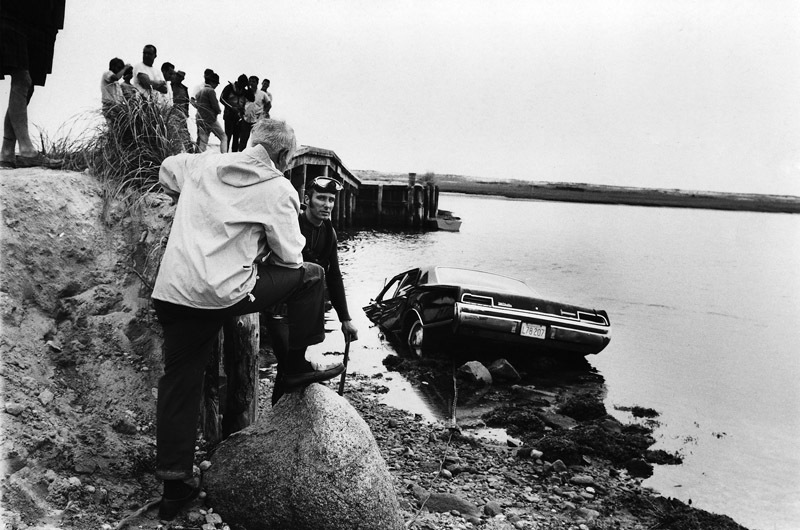 On July 18, 1969, Senator Kennedy drove his car off the Dike Bridge, then a narrow wooden structure with no side railings, after leaving a party. A young campaign worker, Mary Jo Kopechne, was a passenger in the car and died after the vehicle plunged into the water. Senator Kennedy did not report the incident to police for 10 hours, and later pleaded guilty to leaving the scene of an accident. He was sentenced to two months in jail, but the sentence was suspended and he served no jail time. The accident made international headlines, became fodder for Senator Kennedy’s political foes, and remains a hot subject for conspiracy theorists. In past years, some Chappaquiddick residents have resented the intrusion of news media and curious tourists, as well as the association of their home with the accident. 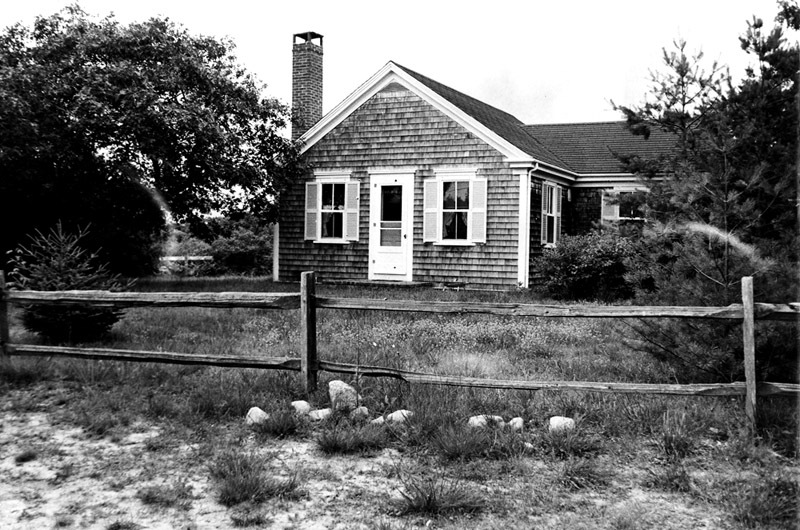 But encroachment on the small island across the Edgartown harbor has waned as time passed. The film is in the final stage of the development phase, but several Chappaquiddick residents contacted for this story were not aware of the project. Chris Kennedy predicted if the company does try to shoot on location near the Dike Bridge, it will find plenty of opposition. But not everyone is unhappy about the prospect of a Chappaquiddick film. The film has attracted plenty of attention in the film industry. Sam Taylor-Johnson, who directed Fifty Shades of Grey, is slated to direct the Chappaquiddick movie. The script by screenwriters Taylor Allen and Andrew Logan was named to the 2015 Black List, a well-regarded list of film projects favored by industry insiders. The production company has not contacted the Edgartown selectmen or The Trustees of Reservations seeking permission to film on the Vineyard. The town owns the bridge and a parking lot, while the Trustees own the causeway that leads to the barrier beach. Joseph E. Sollitto Jr., clerk of the Dukes County Superior Court, said no one has contacted the court recently for records of the legal proceedings. Sam Taylor-Johnson, third from left, director of Fifty Shades of Grey will helm the movie. Mr. Sollitto was in the courtroom in Edgartown on the day Senator Kennedy pleaded guilty. A law school student working summers and weekends as an Oak Bluffs police officer, Mr. Sollitto was often called on to provide security at the courthouse. He was quite surprised when the senator’s wife, Joan Kennedy, entered the courtroom and took one of the few remaining empty seats, right next to him. In the storage room just off his courthouse office, Mr. Sollitto pulled down an unabridged dictionary-sized book, the original transcript of the inquest into Ms. Kopechne’s death. It was first impounded by the court, but later made public. He remembers a mob of reporters gathered in downtown Edgartown, but initially, year-round Vineyarders didn’t show much interest, he said. Mr. Leland was elected foreman of the grand jury months before the tragedy at the Dike Bridge. When prosecutors declined to convene the grand jury, Mr. Leland called it into session himself. A judge ruled that the grand jury could not see the impounded inquest documents, and could not subpoena witnesses questioned during the inquest. The grand jury did not return an indictment. To this day, Mr. Leland is frustrated at the legal process. Mr. Leland’s insistence on an independent grand jury investigation earned him enemies. Stephen Kurkjian was a young reporter with The Boston Globe and beginning his fourth year attending law school at night, when he got a call from an editor telling him to get to Chappaquiddick fast. He was staying at his family’s summer cottage in Plymouth. Mr. Kurkjian went to work tracking down the medical examiner, knocking on doors near the Dike Bridge, and dogging the district attorney in charge of the proceedings. He was waiting outside the courthouse for Senator Kennedy to appear before the Hon. James A. Boyle when he pleaded guilty to leaving the scene of an accident. He said the high drama and political consequences were a seismic event, like nothing he had ever seen. Producer Mark Ciardi, president Apex Entertainment. Islanders may have been proper, but they cast a skeptical eye on the spectacle surrounding the scandal. When Judge Boyle convened the inquest in January 1970, reporters once again descended on the Island. The Vineyard Gazette made special note of the apparel of the press corps. Some people mark Chappaquiddick as the point when Martha’s Vineyard transitioned from a farming and fishing community with a few summer visitors to a tourist destination known all over the world. 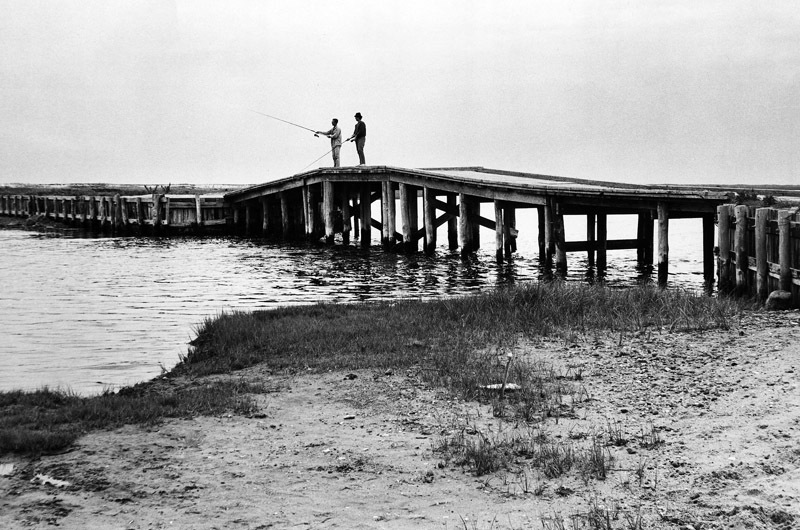 “When Chappaquiddick happened, the world knew where Martha’s Vineyard was,” Mr. Leland said. Agreed. Let them rest in Peace. Still falling on the sword for him I see even though you know that he has a front seat in hell! I will take any part in that film for FREE! Even the leading roll! I was here at the time and know ALL the players! I Sure hope they contest Les Lealand!! Don't forget to ask John F who as an EFD diver pulled her from the car. If Ted acted responsibly and reported the accident as soon as possible she may have had a chance to live since it was suggested there was a pocket of air in the car. How come no autopsy? That would have ended any mystery whether it was drowning or asphyxiation. I feel for Mary Jo's family who will now have to re-live this nightmare. RIP. Responding to: "Let them rest in Peace."??? How about Mary Jo Kopechne's family, what about her untold story? I've read quite a bit on this over the years and the story has to be told from a fresh perspective before the last of the living players are deceased. Teddy got away with unintentional vehicular homicide and we all know it! Agreed ....Let them rest in peace. As 60 yr summer residents,gram always said the incident on Chappy brought the crowds to our place of peace n quiet. Do we really need more foot prints ,trash and curious ones ? Please stop another circus. Spare everyone, including the Kennedy family who has nothing to do with this. Sam Taylor-Johnson is not third from right in your photo. She is second from right. The director is that blonde in the white gown. Thank you, Arnie, for pointing that out. We meant third from the left. We've updated the story. "You’ll see what [Senator Ted Kennedy] had to go through.” - really? maybe it was a right wing conspiracy what a cover up. the only similarity today is what the current candidate gets away with. Please leave Chappy alone! Go ruin some other tiny island. Ted did enough damage already. If Teddy wasn’t a Kennedy and this was not Massachusetts and in particular Martha’s Vineyard he would have died behind bars. The travesty of lies,deceit, and bribes in Mary Jo’s tragic dearth case is almost unbelievable.It’s sad, but in a twisted way, funny at the same time.If the film materializes and continues in the hide the truth Kennedy style, I recommend Paul Reubens for the male lead and Lindsay Lohan for the female part.Hillary could be a consultant to embellish the lies and remind everybody about what difference does it make now for Mary Jo ? Doc Nevin (Robert Nevin MD) whom I knew told me that Mary Jo did NOT drown. ... she did not have water in her lungs. Johnny Farrar, who donned a skin-diver's suit and retrieved the body, confirmed this: she was found in the back with her head tilted back in an air pocket, where she breathed her last breath. She was alive for some time. Teddy Boy should have done some jail time over this. As the first patrolmen on the scene after Jim Arena, I want you to know, and this to my knowledge, has never been disclosed. When the car was removed from the water, I found a Nantucket type pocket book on the floor of the front passenger seat. The pocket book belonged to Mary Keough. I might have misspelled her last name. Why would have another woman's pocket book been in that Oldsmobile if that person wasn't in the car? Mary Jo was a petite young woman, and she was propertly dressed. How could anyone rest in peace without the truth being said? But it is to bad our system has to rely on Hollywood for that! Jane, I have to disagree with you statement. I was there as an Edgartown police officer, and helped remove Mary Jo from the dingy that John and Lary Mercier had placed the body. She was put on a litter from our station wagon, since in those days, that is all the police had for emergency vehicles. When Doctor Mills, the acting medical examiner, Bob Nevin was on vacation, pressed on Mary Jo's chest cavity, out came all kinds of fluids. I was throwing up at the sight, and will never forget that day. I wonder to what degree the director will try to contact people from the Vineyard,such as yourself, especially so many years after the fact, and when people might feel more free to say whT they saw, heard, etc. I would love to know if there is anyone alive who knew what happened. Yes, M. Knight, there are still lots of us alive. I, in fact, talked to Jim Arena this morning. Between the 2 of us, we harbor a great deal of info that has not been aired or published publicly. I have been coming here since the 70s I have done a great deal of research for documentaries, and it is rare for so many people to be alive and 'reachable'. Reading what you said I wonder, especially in the wake of whatever this film turns out to be , I wonder if just for yourselves it wouldn't be important to together document the events of that night and its aftermath that went on to change history. Even if you show it to no one, just the act of the combined truth the best it can be known. I am sorry maybe I sounds silly, but I was particularly struck by what you said. Lorraine, perhaps you are looking at this incorrectly. If the Kennedy “influence” had not suppressed the truth and many of the facts our island would not have been so “trashed"
Please leave the Honorable Sen Ted Kennedy alone... He was a great role model and wonderful Senator...he was a great guy! He made a little mistake and paid for it dearly he suffered eneough!!! Bruce I should let you know that sarcasm does not come through in this forum. Yes, he was great, and on the right side of all the issues, but essentially being responsible for someone's death without the possibility of rescue attempts , is MORE than a small mistake. Bruce, I'd say with confidence that if your daughter was in that car and died, you'd probably not call it "a little mistake". Don't downplay Ted's inactions. Why must the Kennedy family continue to endure so much suffering? This film will no doubt be a scandalous attack on one of the finest Statesmen in the history of the US. I will not support this film and my Chappy friends will hold my hand in solidarity. Reading some of these comments, one would think Kennedy was the victim here. Don't forget who the victim was. In fact a lot of people were victimized by his spectacular lack of judgement. He never got my vote. Mix 46 years, the haze of memory, and the astounding amounts of booze and narcotics numbing the brains of the typical islander back then and you're certain to get a minimum of 17 "never before heard, I was there" disclosures today. The Kennedy-Kopechne travesty occurred four years before I moved to Martha's Vineyard in 1973, where I lived and worked for 13 years. Before 1969, I had visited the Vineyard as a child with my parents, and I remembered it as a peaceful, uncrowded vacation destination. Then, in 1974, the filming of a certain blockbuster shark movie altered the landscape irreparably. The Chappaquiddick incident and Jaws both contributed to the notoriety of the Vineyard, and it will never fully recover the charm it had in the halcyon days of the early 1960s. Yes, the screenwriters, producers and directors of this proposed film should meticulously research what happened at the bridge on Chappaquiddick and interview everyone they can find, including some of those who have posted comments above. However, they should never consider making their movie on Martha's Vineyard. As an occasional visitor now, I would find the circus atmosphere intolerable. Besides, the reconstructed and fortified Dike Bridge bears no resemblance to the bridge of July 1969. Kindly don't exclude some rather high profile politicians as well as the mechanical shark. My book, "Chappaquiddick Tragedy: Kennedy's Second Passenger Revealed" has just been published in April. It explains everything that happened, who participated, why so much lying occurred, and bases every conclusion on records of the time. No imagination, no conspiracy theories, no attempt to vilify, no attempt to rehabilitate, just a rational discussion. Read it. You'll believe it. One of the lesser tolls of tragedy is the way it taints places. In a voice that was at first inaudible, Senator Edward M.